In our community, we have a duty to strengthen the weakest among us to build a better society. The world is so empty if one thinks only of mountains, rivers & cities; but to know someone who thinks & feels with us, & who, though distant, is close to us in spirit, this makes the earth for us an inhabited garden. 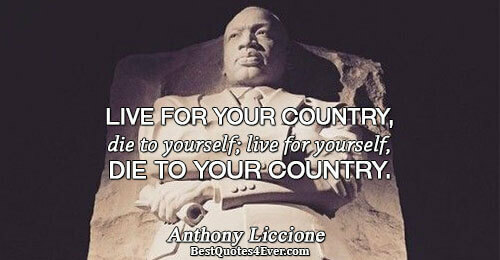 Live for your country, die to yourself; live for yourself, die to your country. A godly woman is beyond average because she keeps her word. She honors her vows. She exhibits great faith. 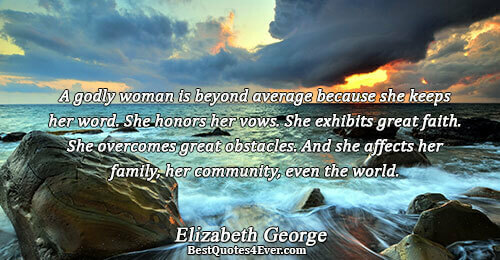 She overcomes great obstacles. And she affects her family, her community, even the world. Everyone was important during the war. Everyone. We worked together and we won. The keys to health and weight-loss: stress reduction, sleep, deep breathing, clean water, complete nutrition, sunshine, walking, stretching, meditation, love, community, laughter, dreams, perseverance, purpose, humility, action. We have to abandon the conceit that isolated personal actions are going to solve this crisis. Our policies have to shift. The words we choose can build communities, reunite loved ones, and inspire others. They can be a catalyst for change. However, our words also have the power to destroy and divide: they can start a war, reduce a lifelong relationship to a collection of memories, or end a life. The natural distribution is neither just nor unjust; nor is it unjust that persons are born into society at some particular position. These are simply natural facts. What is just and unjust is the way that institutions deal with these facts. Work is easy when it’s full of meaning and shared with others. Sloth may disguise itself as "conscientious work" and meet with various forms of public approval or success. But work that is not motivated by love for the life of the community, beyond the temporal and spatial confines of one's own small life, cannot free either worker or community from profound anxiety. There is, in fact, a paradox about working to serve the community, and it is this: that to aim directly at serving the community is to falsify the work; the only way to serve the community is to forget the community and serve the work. Love is our most unifying and empowering common spiritual denominator. The more we ignore its potential to bring greater balance and deeper meaning to human existence, the more likely we are to continue to define history as one long inglorious record of man’s inhumanity to man. Create your own community of liberation. From this moment on, direct your most concerted efforts, your best work, and your greatest feats of imagination toward creating the impossible community, and do so first of all precisely where you are, with those around you. Everybody is a story. When I was a child, people sat around kitchen tables and told their stories. We don't do that so much anymore. Sitting around the table telling stories is not just a way of passing time. It is the way the wisdom gets passed along. The stuff that helps us to live a life worth remembering.